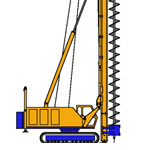 The technique of Continuous Flight Auger (CFA) has become a very popular piling procedure due to the fast installation of piles. 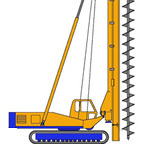 The drilling auger has a hollow shaft, to enable the concrete to be pumped along it, the length of auger is equal to the total length of pile. 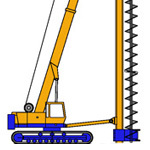 The execution secuence is the following: Drilling by means of continuous auger, concreting through the hollow auger shaft, installation of Steel cage driving it into the concrete mass by means of its own weight, by blowing, by vibration.